—smooth bore to rapid fire and more! For the first year, Civil War firearms reflected antiquated technology. Soldiers carried smooth bore muskets, which were long gun muzzle loaders (see illustration above) that shot about 300 feet. But the war prompted the need for soldiers to shoot straighter, further and faster. 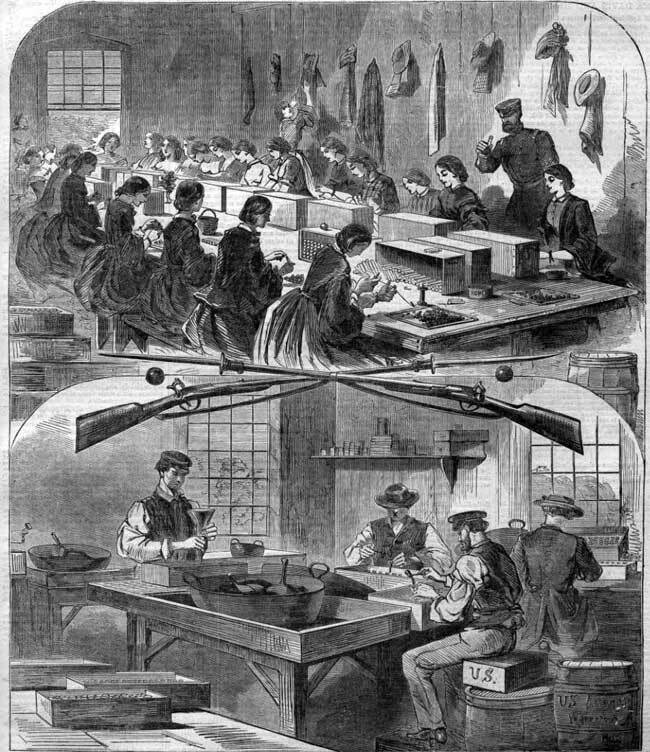 Berdans Sharpshooters, Harper's Weekly, October 5, 1861. The above telescopic rifle is a competitive target rifle. Shown below the rifle is an enlarged view of the muzzle front manufactured to fit into the end of the barrel and aligned with pins, making loading easier. Viewing through the telescope mounted on top of the barrel was blocked if the false muzzle remained installed before firing. A telescope runs the length of the barrel allowing the shooter to be very accurate for its 35 rod range. A rod is 5.5 yards. Hiram Berdan was a renowned marksman and chosen to form and lead two regiments of sharpshooters. The test for becoming a member of the company was rigid. A description in the August 7, 1861 New York Times read: Some idea of the rigidity of the test may be gathered from the fact that no man is admitted who does not shoot, at 600 feet distance, ten consecutive shots at on average of five inches from the bull's eye. That is, the aggregate distance of the whole ten shots must not exceed fifty inches. Not a man is accepted under any circumstances who varies a hairbreadth from the mark. Remarkable though it may seem, many of the man exceed this proficiency. Col. BERDAN himself has, on a windy day, with a strange rifle, put ten balls within an average distance of one inch and one-tenth each from the bulls-eye, at 600 feet. At 1,000 feet the Colonel made a string of 22 inches. The 1st and 2nd U. S. Sharpshooters fought in many of the major battles of the Civil War. When the regiments first formed, recruits were encouraged to bring their own guns, but this lead to having to stock many different kinds of ammunition. Berdan chose and finally issued the M1859 breech-loading Sharps rifle for his troops. 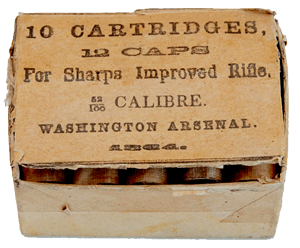 Washington Arsenal 52 caliber ammo package (1864) for Sharps rifles, a competitor to the Spencer rifle, another favorite of troops. 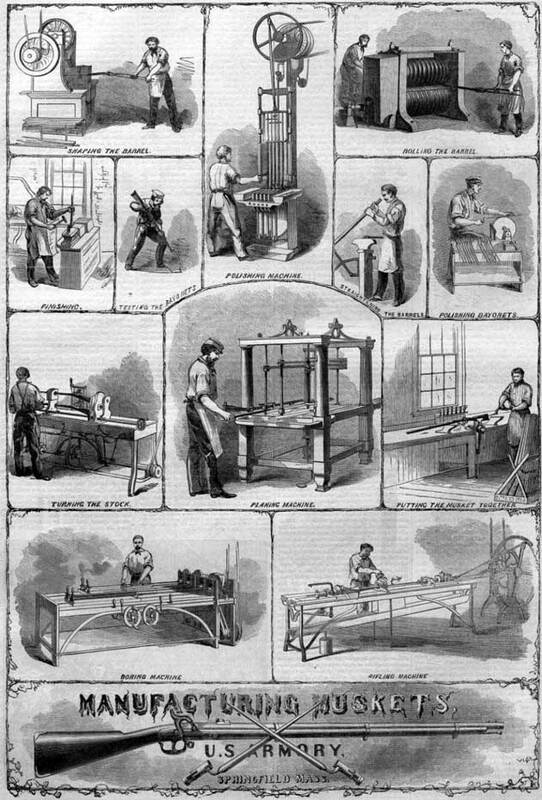 A major Civil War invention innovation was the development of the repeating, or rapid-fire, rifle. 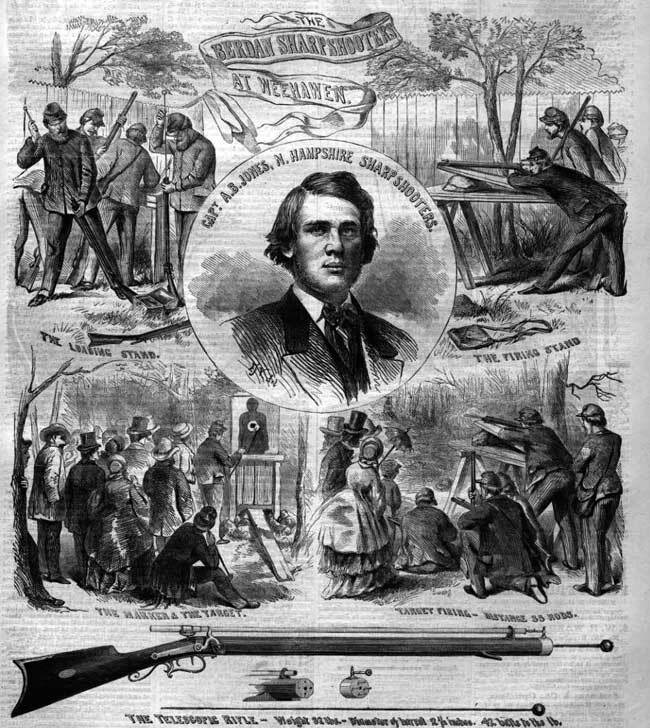 Christian Spencer in Hartford, Connecticut, developed the Spencer Repeating Rifle, the world’s first practical repeat firing gun, which shot a .52 caliber cartridge. The real innovation to hand carried Civil War weapons was the rifling of the gun barrel—cutting spiral grooves inside the musket barrel. Also, a French military captain named Minie invented a conical bullet that fit into a cap; it was slightly smaller than the barrel diameter and could be loaded much faster. The Minie ball ammunition engaged the rifled gun barrel better, tightly spinning and reducing wind friction and increasing accuracy. Civil War bullets became much more deadlier as soldiers could then hit a target more than 900 feet away. 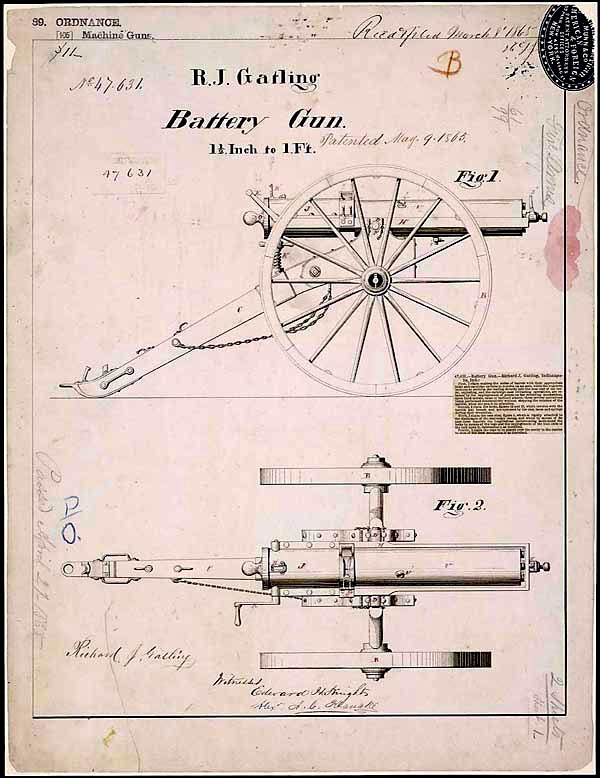 1860 Henry .44 caliber rifle with an octagonal barrel and patent drawing (above). 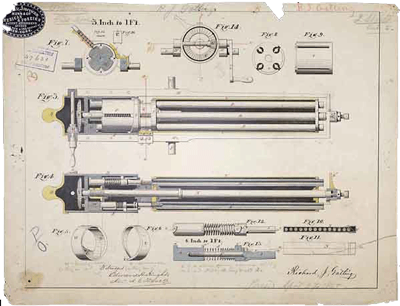 Note in the section drawing that bullets waiting to be fired are in a round tube magazine under the barrel. 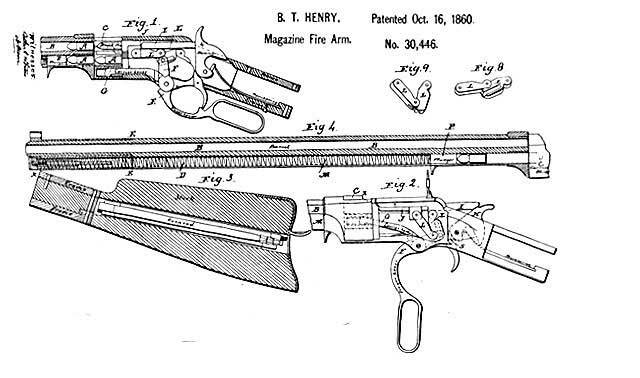 The breech-loading lever-feed Henry rifle, a competitor to the Spencer, could fire 25 shots per minute. The down stroke of the lever discharged the spent cartridge and a spring inside the magazine under the barrel moved the next round into the firing chamber. By the third year most Civil War soldiers on both sides had breech-loading rifles that were quicker to reload and repeated firing. 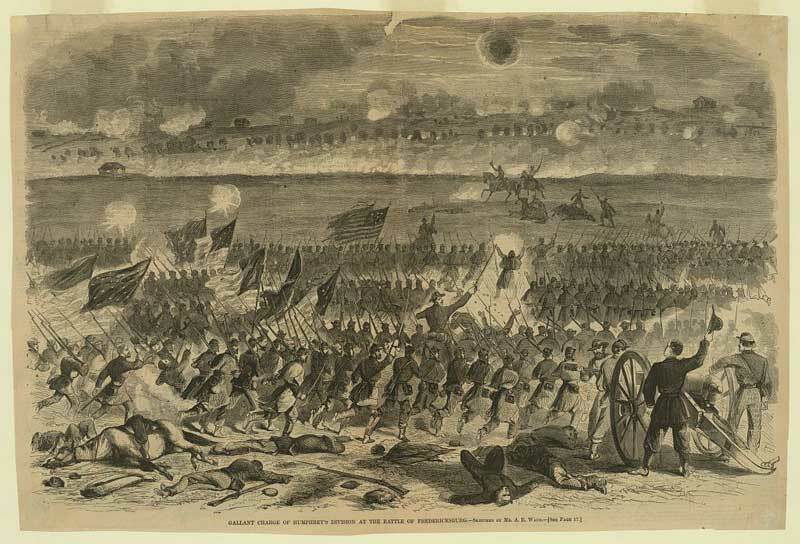 Gallant charge of Humphrey's division at the Battle of Fredericksburg, drawn by A. Waud. In spite of these Civil War technology innovations, the frontal attack continued to be the preferred, yet disastrous strategy. Commanders had been schooled in a classical military tradition and were slow to respond tactically to new gun and armament technology. 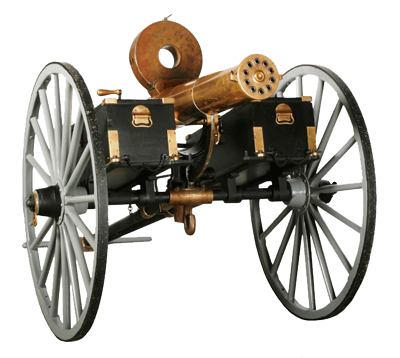 The Gatlin Gun, patented by Dr. Richard J. Gatling in 1862, the most successful rapid-fire gun and ancestor to the modern machine gun, was used to deadly effect. However, it was not often used during the Civil War, perhaps because it was also cumbersome to move, and sometimes it jammed.